Like most life skills, learning the value of a dollar is an important concept that if not taught at a young age is hard to grasp. The best time to begin teaching this concept to your child is when they are able to comprehend what you are asking them to do and are able to do the task requested. 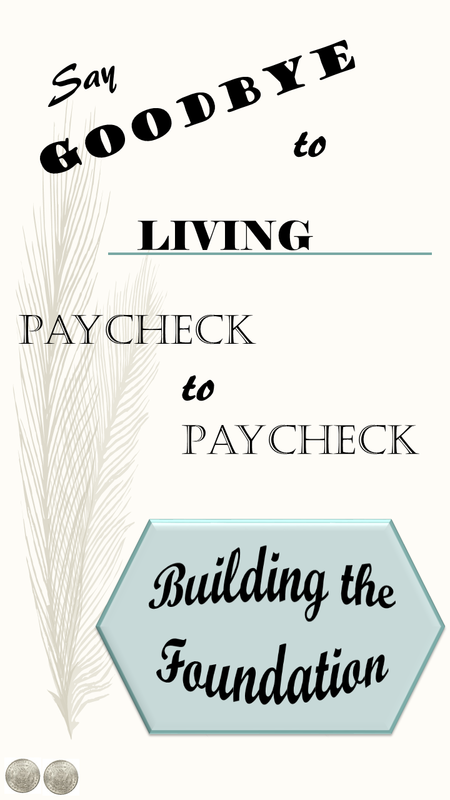 I know, you’re probably wondering where I’m going with this because the series is called “Say Goodbye to Living Paycheck to Paycheck” and of course, children this young do not even know what a paycheck is let alone what it means to live paycheck to paycheck. Through my years teaching all ages and different tasks, I’ve found that I have best learned the topic at hand when I am teaching the topic to someone else. Many times, as adults, we want to skip to the end solution. So, instead of looking at what a dollar is, how much it’s worth, how many dollars you need to pay off your credit card and how much work is required to reach that goal, we often look straight to the end goal by trying to find money really quickly by being dishonest or giving up because the goal seems unattainable. It is important to always take a step back and analyze. So, from the beginning. Your child is starting to understand your requests and act them out. This is a very exciting time for you as a parent and for your child! I bet you’ve started with teaching your child how to clean up their toys by taking them from the floor and putting them into their toy chest. So now that your child knows how to do this simple task, why not teach them another like putting food in the dog bowl, watering the flowers, or dusting their bedroom furniture. Whatever the task is, you need to decide ‘Is this a task something that is expected or is this something extra’. Here’s where learning the value of the dollar comes in. 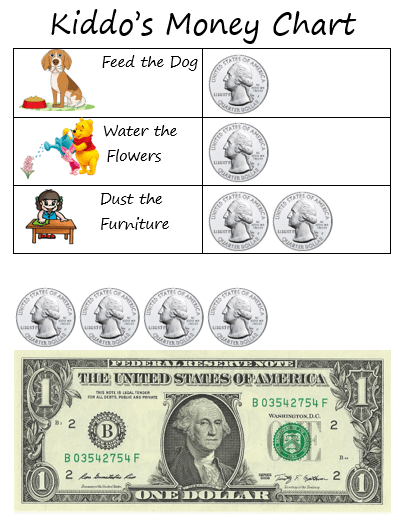 If this task is something extra that is not required of your child but they could do it on occasion when they want to, then this task is a great opportunity to teach your child about money. If you had said that the task is something expected, I suggest not using the task as a way to learn money because it could teach your child that anytime they do what they are supposed to be doing they will get money. Instead, use something else that’s interactive like maybe playing a learning game together after an expected chore is completed. Since your child is young, most likely either 2 or 3 years old, you do not use much money to teach the concept. Let’s say if your child decides to feed the dog, they get a quarter. They can then put this quarter in their brand new piggy bank. (Or you can use any type of token or counting toy to avoid the choking risk. Granted, stay with your child to teach the whole lesson and the quarter will be in the piggy bank long before your child decides it’s best as an afternoon snack. Here comes the important part. Your child will need to have a reason to connect with the quarter. This is something that can be personalized from one family to another, but one way to do this is by explaining to your child that when they get four quarters, they can go to the dollar store and pick out any toy. Each time they get a new quarter, take out all of the quarters, count the quarters, and explain again that when they get four quarters they can get something from the dollar store. Of course, nobody wants to be going to the dollar store every other day, so make limits as you see fit. Maybe you go to the dollar store every Monday and your child can bring their money with them. Or maybe once they get to 10 quarters you go to the dollar store. Of course, 10 isn’t easily divisible in dollar terms but the number is great for learning how to count. As your child grows and learns, you can do fun things like creating a chart to show different values for different tasks. You can also begin to teach them money skills that they would otherwise be learning in the first grade by simply explaining each step as you go. Ex: This is a quarter. When you have four quarters *Show four quarters and count, 1, 2, 3, 4*, you can get a dollar *Show a dollar bill* and trade the quarters for the bill. This concept will be harder to understand but it will begin to teach your child the worth of money and will save you from having to get a roll of quarters from the bank. Remember, the goal here is to begin to learn the value of money, not to complete the tasks to perfection. Of course, with the dexterity of a toddler, it is likely that dusting will not be effective. But, the takeaway is that they do the task and get the money which they have to save to get something that they want. This is so great! A family I used to babysit for does this with their 3 boys and it is amazing! They love going above and beyond knowing that soon enough they will have enough coins to get a treat OR they know a certain treat costs a certain amount of money so they learn young the importance of saving and doing good! Teaching children about money is very important. My kid is only a toddler right now, but I want him to understand the value of money when he gets older. This is a great idea to teach the little ones. My parents did this when we were young and it’s worked with us both. I completely agree with teaching them independence at a young age. My two (11& 8) are now beginning to experience entrepreneurship. They make soaps, candles and brownies and sell them out the front of our house. They’re learning about supply and demand, surplus stock and budgeting. Such a great idea! We started this with our son but then last year we decided to move to Norway 😬 So we kind of stopped doing it! Guess it is time to start again. This is a brilliant idea! Not only does it teach your child the value of money and earning it, it also does not over- reward for every day tasks such as brushing teeth, etc which I find can be a bit too much. I think it would also instil a good work ethic in the child for later life. Great tips! .My daughter is 8 and she is saving her bday money and chores and she ‘s really proud of that. It’s never too early to start teaching how to save! This is great! I don’t have kids myself but I know how important it is to teach children about money. It isn’t something that is taught in school and so parents need to educate kids on what is one of the most important things in life. Life shouldn’t be centered around money but it is what we need to have a life in this world. Great piece! LOVE this! My hubs and I are on the Dave Ramsey plan. I really really really need to get my finances under control. Love your money chart – I am going to grab a copy of that just now – and yes teaching them the value of their money – I realised just this weekend that my kids really don’t get the value of money and how expensive some things are and how hard you must work to afford certain things you get for them!